You will be picked up at your hotel and driven to Huacas, a little town close to Playa Conchal, a beautiful white sand beach on the Gold Coast of Guanacaste. After a 15 minute drive, we arrive to a local home where you will be greeted as part of the family and will get the opportunity to share some of the local traditions with them. Watch the mother make authentic homemade tortillas on a traditional wood burning stove, enjoy a cup of freshly poured Costa Rican coffee, taste some homemade cheese and learn about our customs. After the introduction to the family the adventure begins! 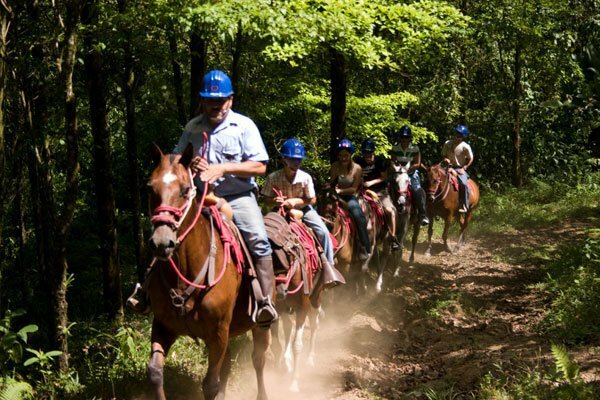 The first part will be a horseback ride through small towns, where you will be able to enjoy great views, talk to locals, observe how they live and work. Halfway, there will be a restroom stop at a local “soda” (traditional restaurant) to enjoy some refreshments. The last part of the horseback ride will end on one of Costa Rica’s most beautiful beaches: Playa Conchal (Shell Beach). As soon as we arrive there you will be handed a scented cold towel, bottled water and some fresh fruit. After that you will have some time off for either snorkeling or swimming. We have snorkel gear ready for you, all included! Long pants (jeans) tennis shoes, a change of clothes, swimwear, sunscreen and towels. Note: Please look for your confirmation email in your spam/junk folder if you don't see it in your main inbox after 24 hours.